PDF to Word ++ is an easy-to-use PDF Converter with OCR ability, which can convert both electronic and scanned PDF documents into editable and well-formatted Word document (.docx,.doc) and Plain Text (.txt). It can preserve original content, layout and formatting after conversion, reduce the need to retype the document manually or get rid of the tedious copy-paste job. 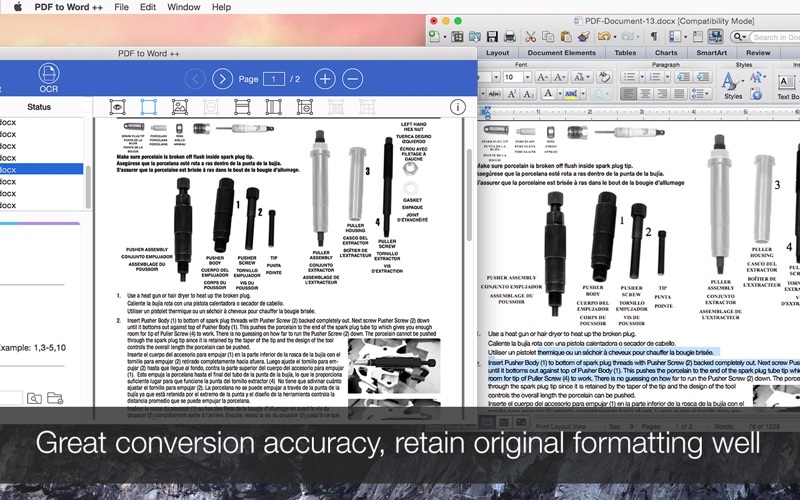 - Converts PDF to Microsoft Word (.docx, doc) and Plain Text (.txt) quickly and accurately. - High level accuracy of content and formatting retention, supports PDF file with multi-column, graphics, formatting, tables and preserves everything as accurate as possible. 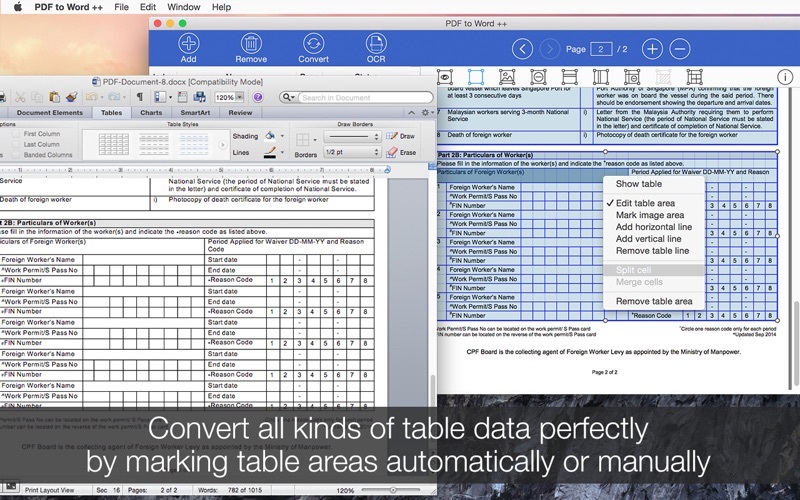 - Detect table data automatically, or you can select table area to retain them as table in Word document. - OCR lets you extract text even if the text is contained in an image. 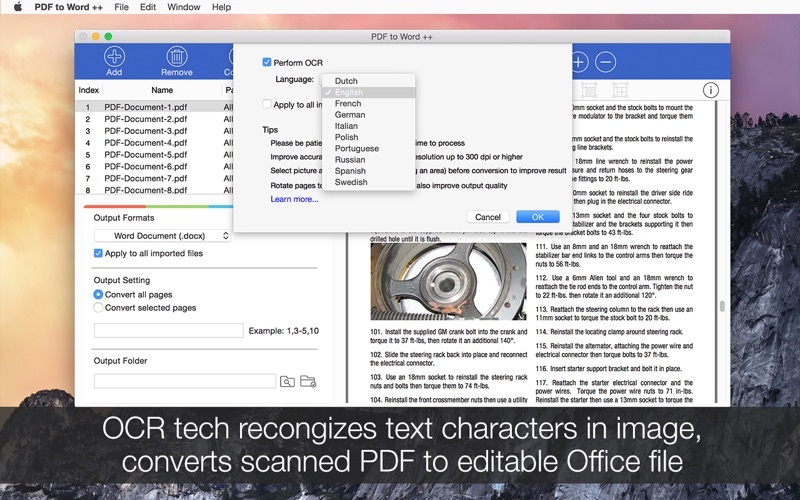 A must-have function for converting PDFs that were created by scanner. - OCR Supports following document languages: English, French, German, Italian, Spanish, Portuguese, Russian, Swedish, Polish and Dutch. - Start with an extremely neat and clear interface. - Convert unlimited amount of PDFs with batch conversion functionality. - Convert any particular pages to save your time. (e.g. 1,5-10,23). 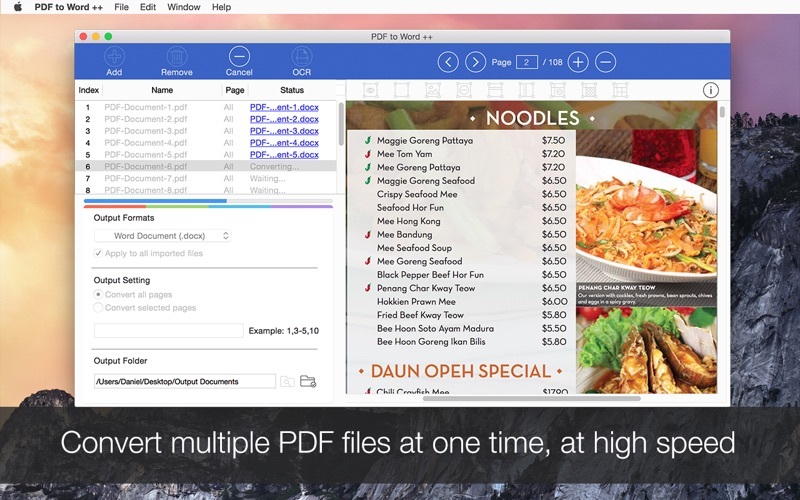 - Built-in PDF Reader provides a quick way to view a batch of PDFs. - Support all versions of Microsoft Office applications. 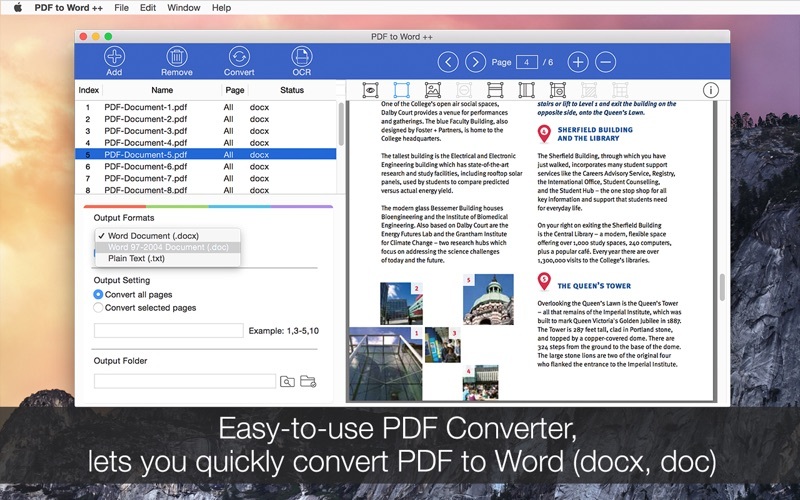 * PDF to Word ++ is a pro version and contains all the functionality of PDF to Word +, with OCR integration. If you have any feedback or questions, we'd love to hear from you. You can reach us via email: support@lightenpdf.com, thanks. 1. Greatly enhanced the conversion quality for PDF to PowerPoint and Pages, now the app can keep the original formatting better in the output file. 2. Enhanced the conversion for Asian characters, including Chinese and Japanese, optimized the algorithm for font matching.